Bacon & Co Bacon & Co.
Only the main roads appear on this map, giving the appearance of a rather spacious capital city. The map is covered with a squared grid to allow for the easy calculation of Hackney Cab Fares. New London Bridge is shown without its approaches. Pecked lines show the intended location of the Thames tunnel. East and West India Docks are shown. 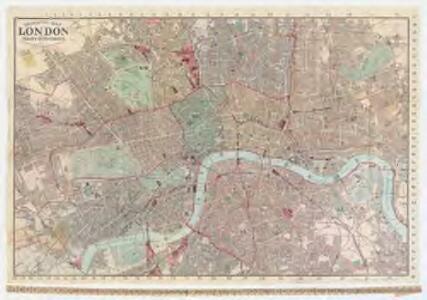 Rowe, S.
Laurie and Whittle's New map of London with its environs, &c. Including the Recent Improvements. The radius of the red circle on this map (above St. Paul's) extends for three miles around the Post Office. The Post Office was erected on the site of St Martin-le-Grand. Designed by Sir Robert Smirke, it was opened in 1829. Coloured roads represent omnibus routes. Buses gradually replaced hackney coaches after the hackney's monopoly ended in1832. The site of the 1851 Great Exhibition in Hyde Park is indicated. Mogg, E.S. Map of LONDON From Actual Survey COMPREHENDING THE Various Improvements to 1851HUMBLY DEDICATED TO Her Most Gracious Majesty QUEEN VICTORIA By the Proprietors E. RUFF & Co. THE CIRCUITEER. A SERIES OF DISTANCE MAPS FOR ALL THE PRINCIPAL TOWNS IN THE UNITED KINGDOM. INVENTED BY J. FREDERICHS AS A GUIDE FOR ASCERTAINING CAB FARES, PORTERAGE &amp;c. &amp;c.
The title of this map of Victorian London appears at top centre, with a scale bar at the foot of the plate. The map is divided into circles, each a half-mile in diameter, allowing the reader to ascertain the distance between two places at a glance. Each circle is also numbered for reference, with a key to the principal streets and squares a in panel below the map, together with an explanatory note. Repeated in French and German, this note reports London cab fares, set by Act of Parliament at 8d (pence) per mile and 4d for every additional half mile. Frederichs, J. 1 : 15840 G.W. Bacon & Co G.W. Bacon & Co.